Car is longer than usual and looks it with so much missing up top. If they stiffened the chassis on the underside I bet this thing handles pretty good, having a very low center of gravity. Imagine rolling about 15 k/hr from the bottom of the hill to the top in Positano in this thing, checking out the sights. The usual odd translation “No environmental sticker, Torpedo The body set up by the ‘platform Colli’sul stretched Alfa Romeo Giulia Super 1965, was designed for use on special occasions representative visits the establishment of the centenarian. Produced in only 2 specimens of which one in possession of the museum, you can in effect define a unique piece!” So that explains it -it’s a few years old and served as a sort of Pope-mobile. Neat how they capped the sills to protect them from shoe soles and added a grab bar to help you in and out. Upholstery looks nice. 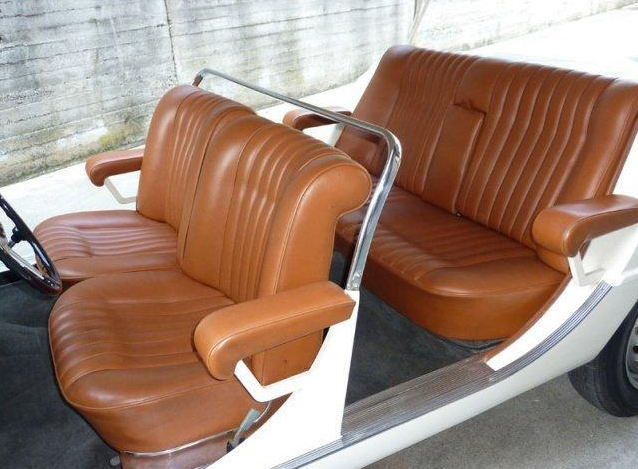 Coachwork back here is tidy. 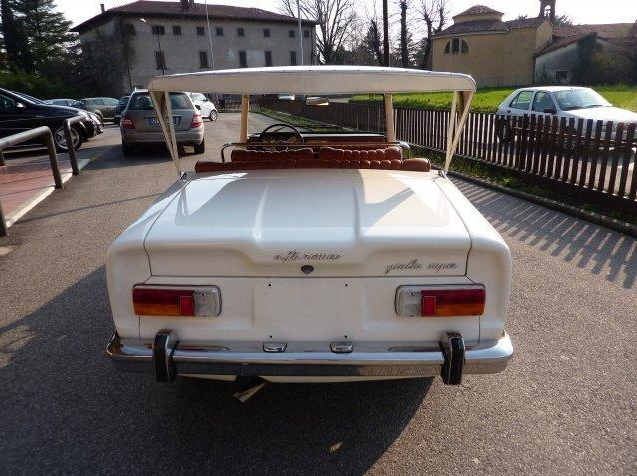 I like the golf-cart style parasol roof. Some rich Rodney Dangerfieldesque golfer needs to roll this on the course at Pebble. Parasol follows the general shape of a Promiscua. I wonder who built this? 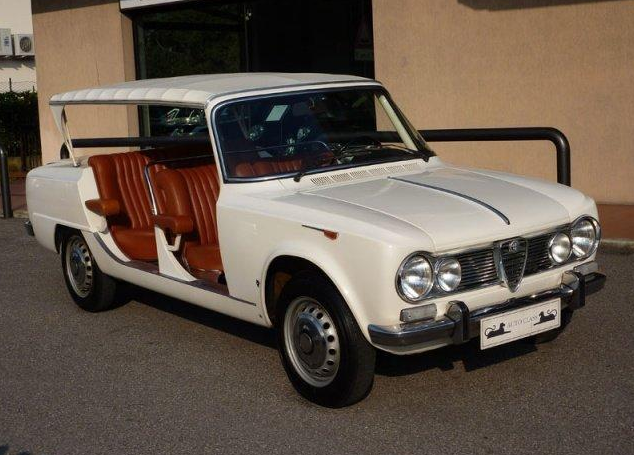 This entry was posted in 2012 markets, Giulietta & Giulia Market, Other Alfa's Market and tagged Alfa Romeo, Classic cars, Italian cars by Hamilton. Bookmark the permalink. Who built it? Doesn’t the description you’ve quoted mention Colli? No dog jokes from me though. Does the reference to “platform Colli’sul” mean it is a product of Carrozzeria Colli? 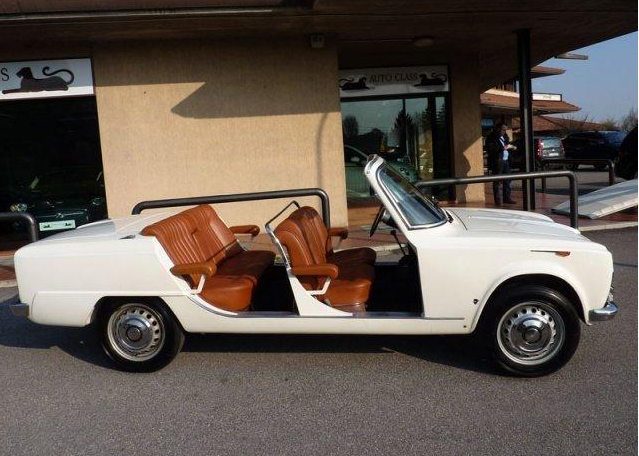 This car was built by Colli who also built a station wagon version of the Giulia. The vehicle being a factory commissioned car and its rarity would set the bar at approx $80k – $90k (to the right buyer). Torpedo bodywork by Colli on a stretched Giulia Super platform. 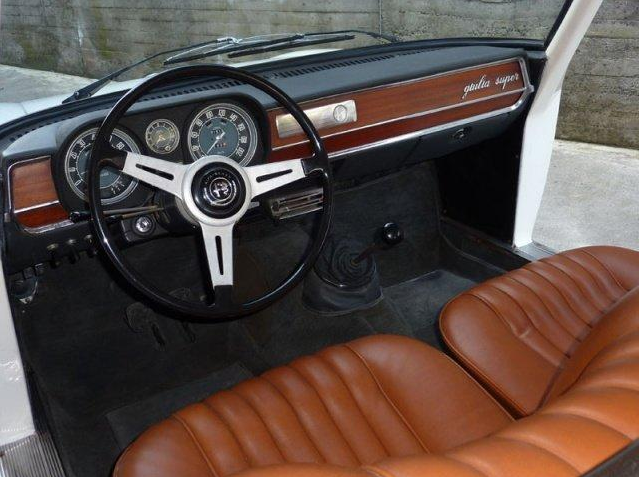 Made for showing people around on special visits to the ‘House of the Snake’ (Alfa). Only two made, the other is in the museum so you could say it is a unique piece. 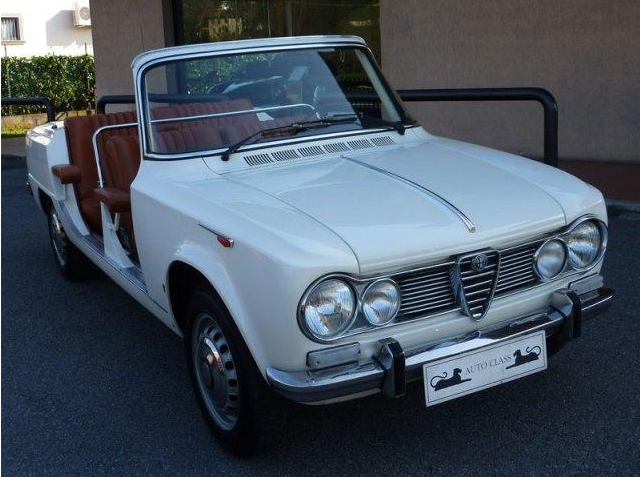 It sounds like it was actually used to ferry bigwigs around the Alfa factory at Arese. The only other one in existence is in “the museum,” presumably the Alfa one. The text here was taken directly from some book. If you copy a section of it and do a Google search you’ll see dozens of sites with the exact same text. As for the car, “Smiles everyone, smiles.” Oddly (or not?) it looks better with the tin top on than with it off. Hello, this car is pictured in the book di Salvetti Curiosalfa. It was used, I think, for the visit of President Sarragat of the Arese Factory. Aurelian’s translation is correct. 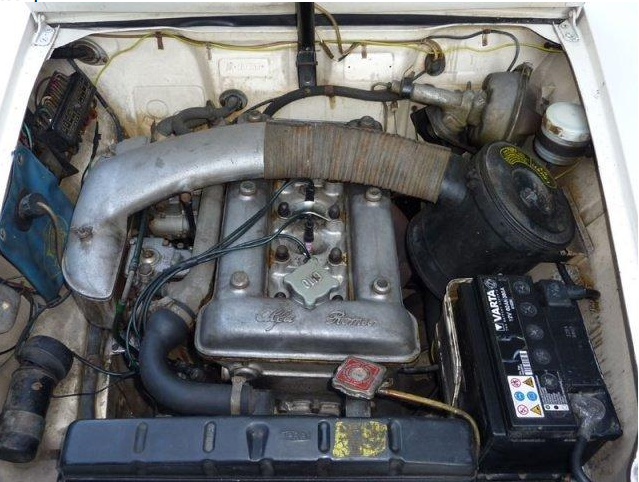 A Torpedo – don’t know if its the same in US – is an open body for a car.